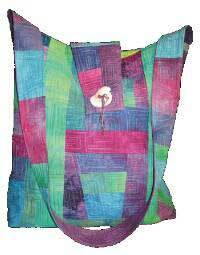 The Flora Bag Pattern by Blue Moon River is an easy to make scrappy tote or purse mostly made with fat eighths. A Bag-E-Bottom C gives the bottom of this bag stability! Finished size is 12 inches W x 16 inches H x 3 1/4 inches D.